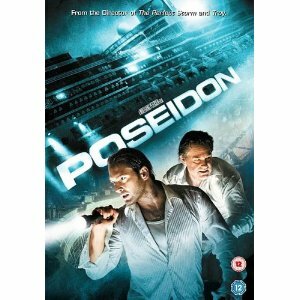 Film Review: Poseidon – I Love Disaster Movies! Sometimes movies get an awful lot of flak for not being the exact vision that may people expected them to be. Poseidon I believe is one of those films. It’s not without its faults admittedly but it is a full on action packed disaster movie that simply does not let up and is simply one of my all time favourite popcorn flicks. New Years Eve sees a rogue wave capsize the Poseidon and trapped survivors try to escape the wreckage before she sinks into the abyss. A rogue wave, a falling elevator, lots and lots of water, a wire, a ship that’s busy blowing itself to bits and Fergie trying to look beautiful whilst crying and failing miserably. Poseidon is upside down on the fifteenth minute of the film – and that includes a two and half-minute credits sequence. We’re (too) quickly introduced to several characters whom all have a mini drama of sorts going on although we won’t really be looking for character development over the course of the film and for what there is, its squashed into bite sized pieces. What Poseidon does best is set pieces. The capsizing itself is fantastically produced but even then other set pieces such as the elevator climb, the underwater swim and the wall of water moments are impressive. What’s more is that because the film spent its money not so much on CGI, but on building real sets to throw into real water, the actors aren’t so much acting but reacting to what’s going on around them. The way how the action is cut gives it a more realistic edge as you see characters jump at explosions, stumble about and genuinely panic when they’re looking like drowning. It’s this editing and attention to catching small little acting nuances that makes Poseidon so absorbing for me. Are the characters chatting about their lives through the movie? No. That’s because they’re busy working on the next problem. It reminds me of adult Goonies – straight from one problem to the next. It’s relentless assault is what drives the film through. The opening credits was at the time, the longest continuous CGI effect produced. Sadly you can also tell its CGI even though it is impressive. Everything’s a bit too clean. Aside from that however the effects are absolutely stunning. The capsizing has people flying everywhere, as does the flooding of the ball room which is impressive as its full of real water and stunt actors. In fact, the actors all appear to do their own stunts too – swimming, jumping, running around fire and being swept away. The sets were all made to tilt and be submerged into water and that’s what makes the film so impressive as it can show everything going on realistically because it was done for real to begin with! Aside from the effects and stunts, its fun to predict the ways people will be bumped off. I think people who will come in the preconception that they will want an experience similar to the original will be bitterly disappointed however. You need to almost rinse the original from your mind. Mia Maestro tugs at the heart-strings but not in the same way Shirley Winters will, the blossoming romance Maggie and Dylan is sweet but modernised and not as pristine as Nonnie and Mister Martin. There is no camp element to the remake and the heart, while its there in the background, has been torn out and stamped on. This is a mean film and therefore will not satisfy anyone waiting for a Linda Rogo put down! All the characters die in a particularly good way however most impressive is Lucky Larry as you know its coming and its so silly its great. Second goes to Kurt Russell for the eerily underplayed and unscored drowning scene which is acted fantastically as is scrambles and panics for dear life. While no one except Lucky Larry was annoying, Mia Maestro was my favourite character as she played her character with a lot of heart and gusto. We knew she wouldn’t last! I did enjoy how Christian’s leg heals like a miracle charm. Aside from that, Mia Maestro’s death I thought was a bit obscure. I actually had to rewind the DVD when I got it and sit and watch it a few times over to get the full picture of it. When I saw the film in the cinema (best way) I went “huh?” to myself. Maybe it was just me. Failing that, we can always go for Kurt Russell’s face underwater. Top marks for refusing the Botox beforehand, we salute you! I’d love to see the original cut which was about twenty minutes longer where we got to know the characters more. This appears to have been the main criticism of the film to date. Wolfgang left after this film when they chopped all the character driven bits out so obviously it was critical to him. As it stands however, Poseidon is a maddening masterpiece of technical wizardry and actors literally being dragged through hell and back and for that, it’s worth every popcorn munching minute of tv time. Superb!